The Aurora Plan. Now available at Clear Pond at Myrtle Beach National. 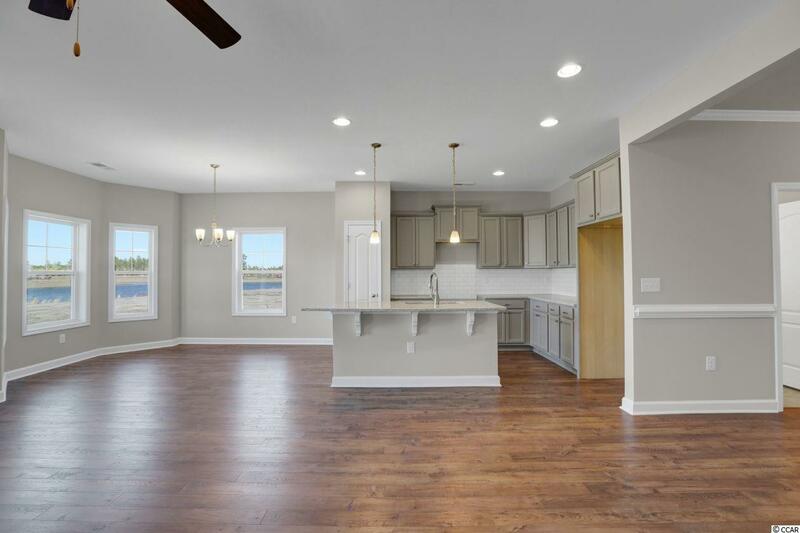 This natural gas neighborhood will feature our most popular home plans and all home sites backing to the privacy and serenity of woods, wetlands and ponds. 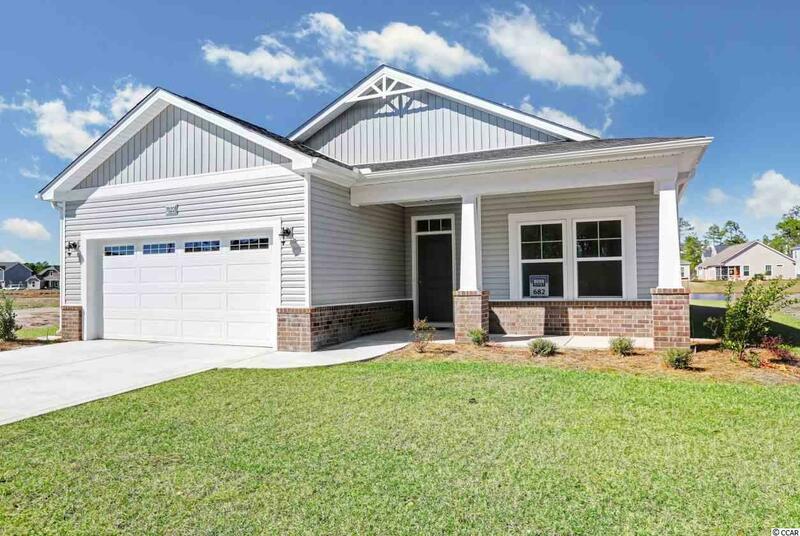 The Aurora is a 2 bedroom 2 bath home with open living space, large kitchen island over looking your great room. great room, kitchen, and dining room. This home is located on the pond. 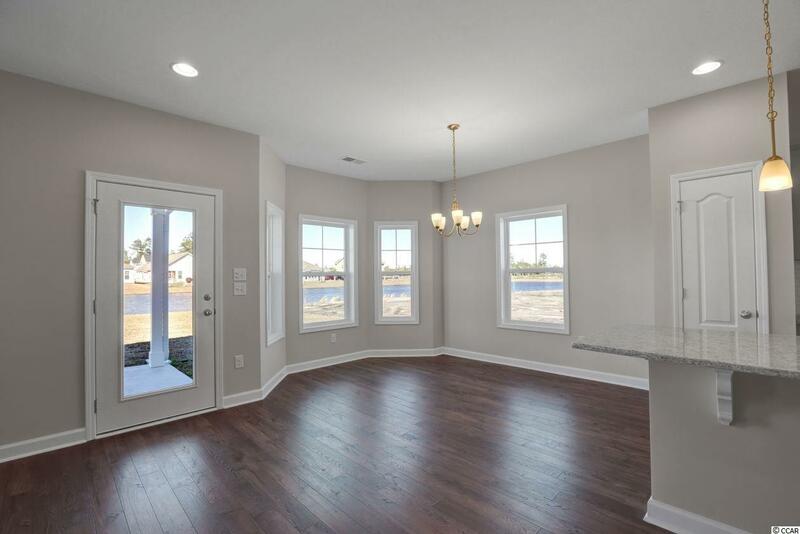 A bay window in the dining room and master bedroom has been added along with 5" laminate flooring in the foyer, great room, kitchen and dining area. Tile in all wet areas. The master has a 5' walk in tiled shower. SST single bowl kitchen sink, with upgraded faucet. A gas range has been added. Additional can lights. Glass in the garage door with hinges. Upgraded granite in the kitchen, upgraded gray cabinets whole house. Upgraded brushed nickel finishes. Best of all, this home was built with our ecoSelect energy program. This means this home has been built with 2X6 exterior walls which allows for added strength and straighter walls. This allow for better insulation of a R19 value. Also included is a radiant barrier in the roof line. Low E windows, energy efficient lighting, 16 seer HVAC unit. Gas heat, gas water heater. All certified by a third party quality inspection. There are plenty of standard options that your H&H home will feature. Some of these are a front porch, 12" ceramic tile floors in the wet areas of the home. 5" Bourbon Mill laminate in the foyer kitchen/nook and dining(per plan) Carpet in all bedrooms. Cabinets are 36"/42" staggered with crown molding. Granite in the kitchen along with Stainless steel appliances. Your master bath will come with double sinks, garden tub and walk in shower. This home comes with full landscaping, irrigation. and gutters on the entire home. So many features to list. 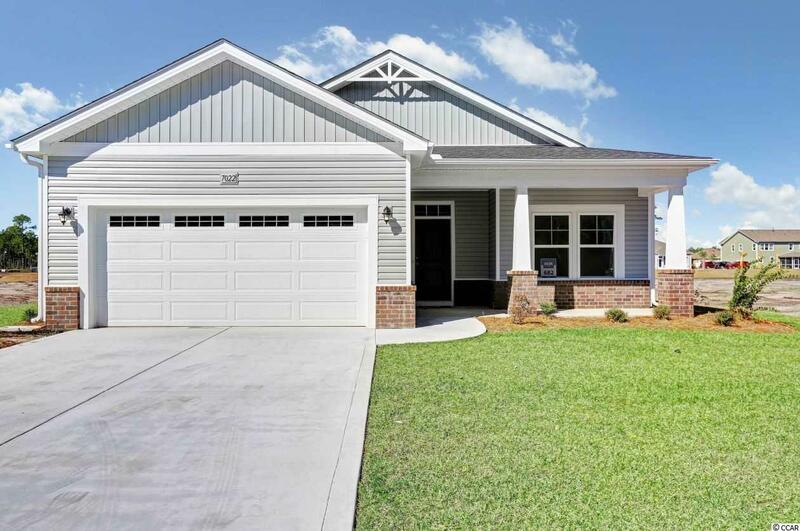 Contact the listing agent for all the details. We also have a full state of the art design center to choose many luxury options and customize your new home. Call your sales representative for more information on this program. Pictures shown are of actual home.